FlashDisk FX-2U122U RAID, 3.5” HDD/SSD to 1.4 PB, 1.0 million IOPS, 5,000 MB/sec. FlashDisk FX-2U242U RAID, 2.5” HDD/SSD to 2.4 PB, 1.4 million IOPS, 5,200 MB/sec. FlashDisk FX-3U163U RAID, 3.5” HDD/SSD to 1.9 PB, 1.2 million IOPS, 5,500 MB/sec. FlashDisk PetaStore FX-4U604U RAID, 3.5” 4.8 PB per rack, 1.0 million IOPS, 5,000 MB/sec. FlashDisk AFA records data in native format with no compression and no de-duplication and delivers 487,000 IOPS & 12.6 GB/sec. — yet costs less per usable GB than competitive systems. Need pricing? Click here . . . The FlashDisk All Flash Array (AFA) from Winchester Systems has been designed to store data in native format without compression or de-duplication. Why? We view them as technologies designed to solve legacy problems based on older flash technologies. With the advent of newer, higher density, cost effective enterprise class flash drives, we simply don’t need compression or de-duplication to build a high performance, yet cost competitive all flash array. The FlashDisk AFA doesn’t use complex software in an attempt to enable consumer grade flash drives like some of our competitors, we only use reliable, proven enterprise class SAS flash drives. With the FlashDisk AFA – your data is never modified from its original format, so there’s no risk of data loss due to de-duplication hashing conflicts, compression or de-duplication table corruption or the associated hardware resources these software layers consume. Your data is always secure, always protected. Optimized for performance, the FlashDisk AFA blends high speed RAID controllers, 8 or 16 Gb Fibre Channel, 10 Gb ISCSI, latest 12 Gb/s SAS disk connectivity and SSDs into an easy to manage solution. 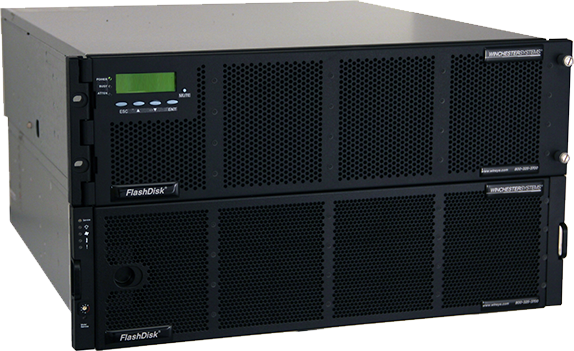 With up to 487,000 IOPS and 12.6 GB/second of throughput – the FlashDisk AFA can easily replace multiple racks of legacy disk drives with a single enclosure, offering significant operational, power, space and cooling savings. The FlashDisk AFA is a perfect VDI solution, with over 90,000 VDI RAID5 IOPS or more than 9.5x the performance of a traditional HDD based array, allowing you to support up to 3,300 VDI users. Database customers can see similar improvements with the FlashDisk AFA, where Orion benchmark testing showed over 8.5x the performance of a traditional HDD based array. The performance of the FlashDisk AFA is consistent and predictable without variations due to the overhead of the complicated software stacks used in other all flash products. This gives you the ability to redesign your datacenter and optimize even your most performance critical environments. With scalability up to 276 TB using two expansion shelves and low initial and incremental costs, the FlashDisk AFA makes it easy to build a configuration to satisfy all your storage needs – without requiring the overhead, costs and capacity uncertainity of de-duplication or compression. With the FlashDisk AFA your capacity is always known and always predictable. The FlashDisk AFA has a robust set of enterprise-class data services including: snapshots, thin provisioning, remote replication, SED encryption and more. With the management simplicity of an appliance – the FlashDisk AFA is easy to deploy and support. Leveraging 20+ years of RAID controller experience, the FlashDisk AFA offers fully redundant, hot-swappable controllers, fans, PSU’s and drives. With proactive SSD wear level monitoring, email notifications and backed by Winchester Systems world-class support – your data is always safe. Unlike other all-flash storage products with complicated pricing schemes based on “effective capacity” – the FlashDisk AFA costs 33% less per gigabyte while offering 2x – 8x the IOPS / $ compared to our competitors – making it one of the best performing yet most affordable products in the market. This offers you the flexibility to deploy the FlashDisk AFA in a variety of both performance or capacity based applications. 100 – 240 VAC / 47 – 63 Hz. and toll free hotline during business hours.